When I saw the new Idoneth Deepkin, my first thought was "wow, there's a lot of Dark Eldar kitbash potential here." The ID definitely have a Dark Aelf feel to them, among other themes, so I don't think it would take much to transform these underwater aelves into convincing evil space pirates. 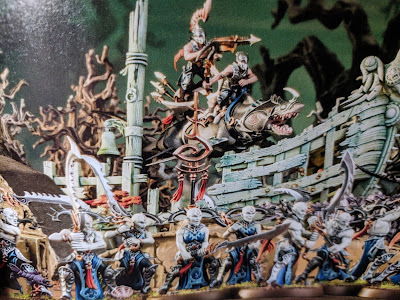 The most basic ID troops, the Namarti (pictured above), look a whole lot like Drukhari Wracks, just with more dynamic poses. Depending on the actual size/scale (AoS tends to be noticeably larger in scale compared to 40k), these could be an excellent option if you are looking to field a lot of Wracks in a Coven army. The official Wrack models have at least been converted from finecast to plastic, but they are still pricey compared to other 5 man plastic kits. 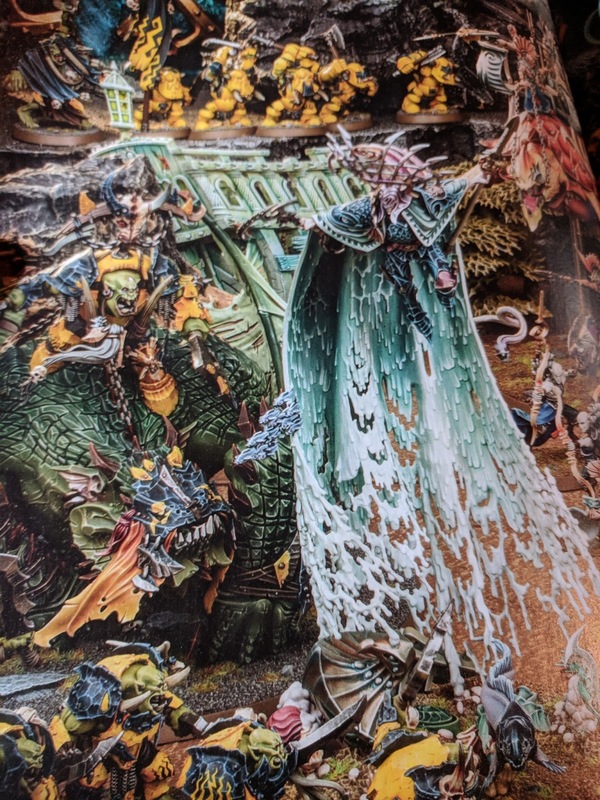 If the ID Namarti box doubles the number of models for around the same price point, and the size factor isn't too egregious, then this is the direction I'll be heading. This Eidolon model is gorgeous, but just look how big it is next to that huge Mawcrusher!? I certainly don't need to be starting any new projects anytime soon, but man... I really want a reason to get one of these kits! I haven't finished reading the Ultimate Guide to ID yet, but from the tidbits I saw it would seem the similarities between ID & Drukhari don't stop at aesthetics. 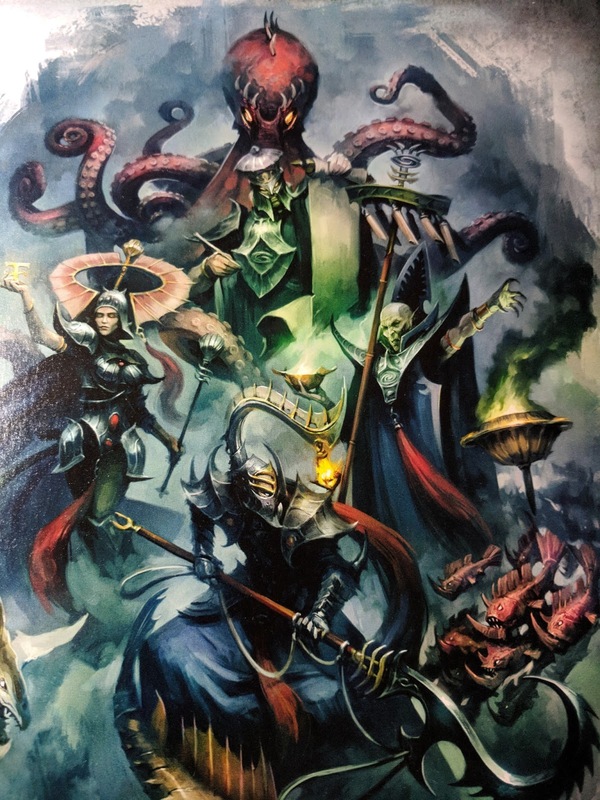 Looks like the Idoneth, much like DE, can only be sustained by conducting raids and capturing new souls. Very interesting indeed. The more I look at the ID model range, the more they grow on me. I had a similar reaction to the Kharadron Overlords release; first thought that's cool, I wonder if I can use any of those bits in my other projects... to OK, a small contingent would look good in the display case and can ally with my other stuff. Haha, this hobby is never ending! GW is killing it with AoS releases recently. They've managed to re-imagine familiar themes along with some strange new ideas mixed in that the end result feels fresh and unique, but also right at home in the AoS universe. I can't wait to see these armies start to hit the tables. But more than that, I can't wait to see what fellow kitbashers do with all these great new bits!